I was asked to take environmental portraits of each of the neighbors and capture them in their elements. I really enjoyed the creative process in working with each person and figuring out how to capture them in their setting. I think each image is unique, and fitting, to each individual. Dasha and Dan Faires own and operate Fairelane Station in Springdale. The event space was incredible and the couple was so easy to work with… even their infant son was game for this photo shoot. I wish every time I had to shoot an environmental portrait I could walk into a space as beautiful as this one. The family and the space made my job easy that day! University of Arkansas College of Business Dean, Eli Jones, squeezed in enough time between meetings for a quick shoot in the newly remodeled entrance of the BA. When I say squeeze, I’m talking about 5 minutes. Planning and preparation made the short amount of time a non-factor during our shoot, and it worked out that classes were in session and we didn’t have to worry about students needing to pass by to make it to class. 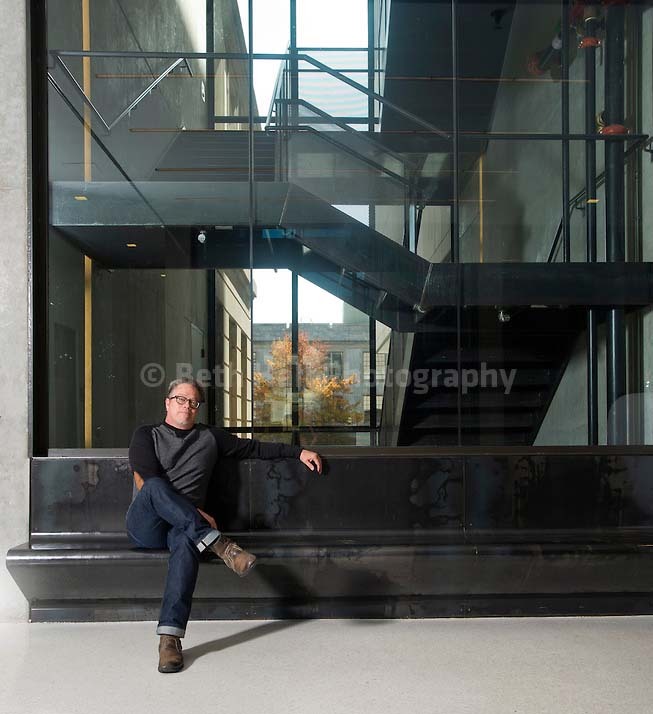 Immediately following my shoot with the dean, I headed to the architecture department to photograph Marlon Balckwell. Blackwell is a practicing architect in Fayetteville, Ark., and serves as Distinguished Professor and Department Head in the Fay Jones School of Architecture at the University of Arkansas. In a location scout earlier in the week I fell in love with the stairwell in the new addition to the building. I also photographed Ken Hatfield, former head coach of the Arkansas Razorbacks. I learned that Hatfield volunteers his time at the VA hospital in Fayetteville where he takes his dog Margo to visit patients. My final shoot was Lorena Ormeno-Larson who is the director of Larson’s Language Center in Rogers, Ark. The school is the only private language school and bilingual preschool in Northwest Arkansas.